Change.org has changed. And chances are that you might have missed it. 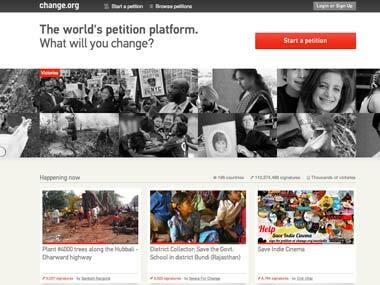 The social action platform, which is credited with hosting many online campaigns to bring about change, is facing criticism for replacing its ‘values based’ advertising policy for an ‘open’ approach in which advertisements are accepted based on the content of the ad, not the group doing the advertising, says a company document meant for internal circulation, but which got leaked before the company could go public with its re-branding strategy. In effect, the company has allowed for advertisements from various quarters including corporate houses and political parties. What this means is that even anti-abortion, pro-gun, union-busting advertising and ads by political parties will be allowed on the site, marking a remarkable change in the overall outlook of the company. Before the policy shift, according to the document, the company’s advertising policy was values based. It accepted clients case by case, one at a time, based on their alignment with its values as a company. The new advertising policy is akin to those of many leading platforms, open by default to any group that wants to advertise with them. “We are open to organizations that represent all points of view, including those with which we personally (and strongly) disagree,’ reads the document. Kamayani Bali Mahabal, an online campaigner based in Mumbai, who has initiated many petitions on change.org, says that the company’s advertising policy shift demonstrates the potential perils of for-profit companies founded on progressive values, and shows the power of money.